Paraiso play for the guests at the world premiere of Warner Brothers PAN. Paraiso's bateria did 5 days filming for the movie. Complete parade at the judging point but it's raining again! Paraiso at the judging point but it's still raining! Special guests Gilberto (GRES Viradouro) and Rose Barreto (GRES UniÃ£o da Ilha) Thanks to ParaCarnival and Axe Capoeira for their contributions to our parade. The complete parade along Westbourne Park Road. Paraiso parades with Serginho do Porto (GRES Salgueiro) and Mestre Esteves. From Great Western Road to Chepstow Road. Thanks to special guests AxÃ© Capoeira. After our show, we enter the Olympic Arena for the Closing Ceremony finale, fireworks and a samba party on stage. Paraiso live on the stage of the Crystal Palace Bowl. Paraiso set up to welcome the Olympic Torch into Gillett Square and special event in Hackney ... but the Torch changed its mind! With Bruno Ribas and Mestre Esteves. This is in Great Western Road. This is in Westbourne Grove. Wantuir (GRES Grande Rio), Mestre Esteves and Ana Paula Evangelista join Paraiso at Notting Hill Carnival 2010. TJ wins the Paraiso School of Samba 2007 Queen of the Bateria competition. Paraiso receive Rio awards for bringing samba culture and the name of Estacio to the UK. Maite puts Carmen Miranda in the shadows ... and watch out for the Paraiso credit at the end. We put dance contestants through their paces in semi-final of street dance TV show Bump & Grind. Paraiso add latin spirit to the opening and theme song of Channel Four's prime time Charlotte Church Show. Sorriso, the sambadrome street sweeper on the Orange advert, at our Queen of the Bateria competition. Patricia wins Paraiso's Queen of the Bateria competition 2006. Mangueira Bateria & puxador Leandro at Paraiso's special open workshop. Paraiso & Mangueira bateria lead carnival parade promoting Brasil Brasileiro show at Sadlers Wells. 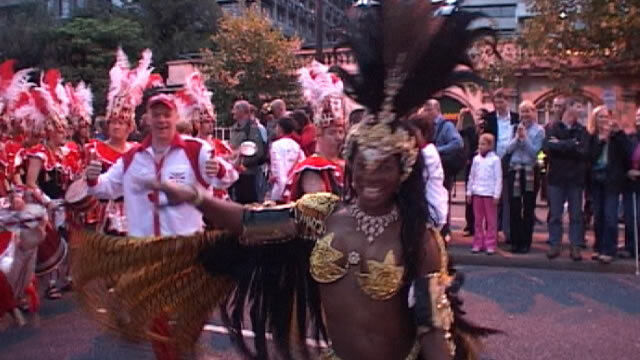 Paraiso teaches BBC Newsnight Culture Correspondent Stephen Smith a few steps of samba. London TV's station ident features dancers from Paraiso. Dominguinhos do Estacio sings & Mestre Esteves leads our Bateria + Rio's top model Vivianne Araujo. Paraiso's Bateria plays outside the Queen Elizabeth Hall on the South Bank, London.